I face right, but I see him not. when he tests me, I prove to be gold. Who then devised this torment? Love. 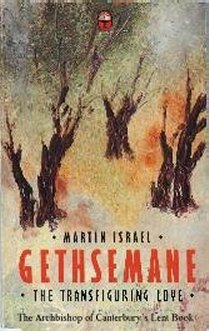 In Gethsemane - The Transfiguring Love, Martin Israel shares his wealth of understanding and wisdom. There is penetrating and sensible psychology. There is profound knowledge of the Bible, sensitively applied. There is a powerful style of exposition, the more authoritative for its simplicity. All these elements combine to offer the outline of a theology of redemption which is rooted in our understanding of pain. In the dark might of Gethsemane, we learn to accept suffering, not to reject or resent it. Innocent pain can lead us closer to spiritual maturity. An important insight here - and there are many - is that the Church at its best is a community of sufferers. The Church is most at home with its true vocation when it kneels with Jesus in Gethsemane. That's never easy, either to perceive or to practise. But, as Dr Israel makes plain, it is fundamental to Christian faith that only the way of the Cross can lead to the perfect peace of God. The chill impact of hell's darkness fell on Jesus at Gethsemane. His agony was especially terrible because it was essentially incommunicable. It is a wonderful thing to be able to share our inmost thoughts with those we love, but there was no one to hear him in his agony. In his great encounter with the naked power of evil Jesus had no one to sustain him, for even his Father seemed to be shut out from his sight by the acrid fumes of impenetrable darkness that enveloped him. And yet, unaided by any outside power, the Son achieved a victory over darkness and suffering due entirely to the power of the Holy Spirit within him. When Abraham was put to the ultimate test of faith in preparing to sacrifice to God his beloved son Isaac, a ram caught by its horns in a thicket appeared in time to avert Isaac's death. But there was no substitute for Jesus; he went to his death in unrelieved suffering. Yet by that very suffering he removed the despair that comes with it, as in his death he removed the apparent finality of death and the consequent vanity of so much mortal life. In his great work in the realms of darkness, the divine presence moved decisively from a point of remote sovereignty outside the cosmos to the centre of the created world, to the centre of the human soul. And so the Godhead, far beyond rational thought and intellectual speculation, is now firmly centred in the soul of all who have faith, who have thereby passed from the barrier of death to the measureless expanse of eternal life. The test of that faith remains, but victory is now assured to all who persist to the end. The reward is the emergence of a new person, strangely like the one originally born, but now cleansed of the world's stain, chaste in purpose and innocent in intent and attitude. It is this theme that we consider in what follows: how we too can partake of the divine nature by entering into the depth of Christ's passion, not merely in the course of a Lenten meditation but by the progress of our chequered lives on earth. The way of ascent to the vision of God embraces a precarious treading of the precipice that leads to hell. Only when hell is restored can we bear the intensity of God's love.